For the most part, I’m all about comfort foods this time of year. It’s cold outside, the ground is covered with snow, the winds are gusting and I can’t get enough soups, mashed potatoes and chicken and noodles. Not to mention hot cocoa, tea and lattes. But, every now and then we get a quick taste of spring with unusually warm winter days in January and February. We’re talking temps in the upper 40’s which nearly feel like the 60’s when you’re used to the frigid 20’s…before factoring in the wind chill. And on those days, I get excited about the upcoming warm seasons and motivated to make fresh summer recipes! Today it’s chickpea salad made with these deliciously healthy ingredients. And those ingredients are tossed in my favorite homemade dressing combination – olive oil, red wine vinegar, cumin, salt and pepper! I’ve also used this on Mexican inspired salads with a mix of greens topped with chicken, peppers, black beans, onions, tomatoes, avocado and cheese. So good! I’m really excited, because on date night this week we were strolling through uptown Westerville and noticed a new (or new to us anyway) specialty oil and vinegar shop, A Twist on Olives! They have 27 different olive oils from around the world, 32 options for balsamic vinegar and a few specialty vinegar options like red wine 🙂 We really should have stopped to look around while we were right there, but we were hungry and on our way to dinner so needless to say on a bit of a mission. I will definitely be going back to shop for new oils to use in this and other similar salads! Our dinner was wonderful that date night too. Uptown Westerville is filled with little gems and our current favorite restaurant is Asterisk Supper Club. The walls are filled with books, the woodwork around the bar is beautiful and the drinks and food are worth writing home about. Check out my Instagram page for a glimpse into their taco Tuesday. If you’re a local or ever in town, I highly recommend stopping by for lunch, dinner or brunch (on the weekends)! Happy hour is a great time to go and the perfect opportunity to try their deviled eggs appetizer for just $4. This is such an unusual appetizer at restaurants, but oh my gosh, those eggs were absolutely delicious! They also do afternoon tea which I’d love to check out some time. It sounds like a perfect atmosphere for relaxing and writing or reading. In the meantime, let’s circle back to chickpea salad. Easy to make, filled with nutrition, satisfying crunch and perfectly seasoned dressing. Five simple steps are all that’s needed: wash your veggies/rinse the chickpeas, chop everything and add to a large bowl, mix the dressing ingredients and gently toss! Make it now to pretend it’s summer time again and make it later to take to those fun weekend cookouts! To make it a complete meal, I’m pretty certain blackened grilled chicken would be a delicious addition. Anyone have any other favorite homemade dressing combinations? I really want to use a little less ranch (tricky task – it’s just yummy!) and I think my new olive oils from A Twist on Olives will be perfect motivation for making more homemade dressings! A fresh and crunchy summer time salad! Wash all vegetables and rinse chickpeas. Cube avocado and add to a large mixing bowl. Pour the juice from 1/2 a lemon over avocado and gently toss. This will add flavor and keep the avocado from browning. Cut remaining vegetables and herbs as directed and add to the large mixing bowl with the avocado. In a small bowl, mix together olive oil, red wine vinegar, cumin, salt and pepper. Pour dressing over the salad in the large mixing bowl and gently toss. Cover with saran wrap and let chill in the fridge for one hour. Serve as a side or add grilled chicken for a meal. Enjoy! 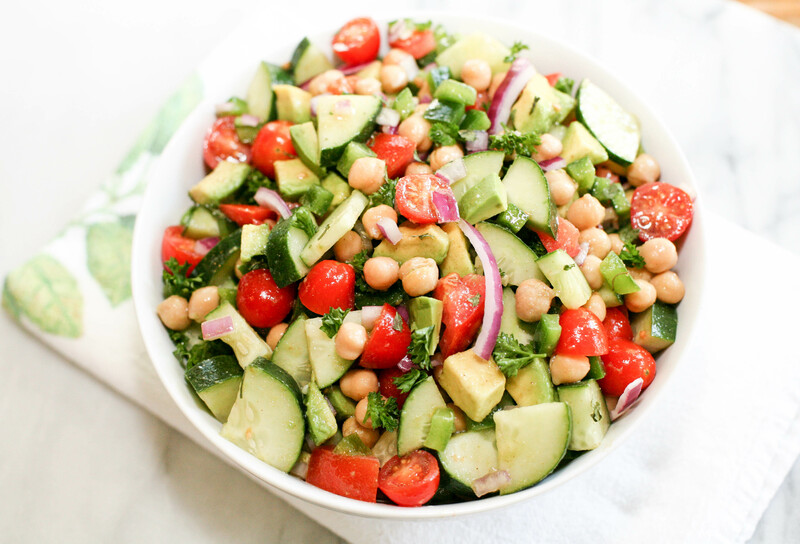 This entry was posted in Recipe Book, Sides and tagged avocado, chickpea salad, cookout foods, easy salad recipes, olive oil dressings, parsley, salad recipes, summer recipes. Bookmark the permalink. Love chickpeas! What a great idea.